Dean and Deluca is a US chain of high-end grocery stores. The company is headquartered in Wichita, Kansas. 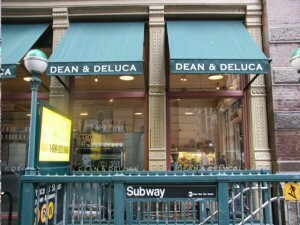 The first Dean and Deluca store was established in September of 1977 in the SoHo district of New York City. The founders of this store were Giorgio DeLuca, Jack Ceglic and Joel Dean. Co-founder Jack Ceglic designed the interior of the store to create an atmosphere of a turn-of-the-century food department. The store had high-ceiling fans and a wide array of products that lined the stores high and white walls. In the white walls were shelves made from stainless steel, display cases for meat, fish and other products, and display counters for coffee and other beverages. In 1988, a new Dean and DeLuca Market was opened on the corner of Broadway and Prince Sts. in the city of New York. This shop was followed by several smaller retail stores located in the Rockefeller Plaza in Manhattan, and Paramount Hotel. Dean and Deluca Espresso Bars were established in different parts of New York, as well as Washington,D.C. Major Dean and Deluca retail stores also offered catering services in local areas. In succeeding years, Dean and Deluca stores were opened in the areas of Charlotte,Napa Valley and Kansas City. In other countries, Dean and Deluca also opened stores in Tokyo, Dubai, Kuwait, Bangkok and Taipei. In May of 2010, Dean and DeLuca opened its latest international branch inside the Villagio Mall in the country Qatar. The company is also planning to open a store in the area of Buenos Aires, Argentina. Today, Dean and DeLuca is known in the country as a purveyor of high-end gourmet foods, cheeses, coffees, teas, baked goods and kitchenware. The stores recently launched a fine wines section that offers premium fine wines from all around the world. The company runs around fifteen cafés and specialty markets in select areas in the country. The company is also quickly growing in Japan. Dean and Deluca offers its products to consumers through gift catalogues (consumer and corporate). The company also has an online shop were most of its products are available for order. T’m searching for information about ordering since I was given a gift card and live near Boston. I have looked through the website and gotten no help. Finally I found a site to request catalogs and sent that to you.. Do you have no online catalog for looking up and ordering specific iotems?